Great tool It would be even better if we could choose ANSI, UTF-8 or UNICODE as text encoding to find inside files. @Jenner: What problem are you having that would be solved by manually choosing the file encoding? 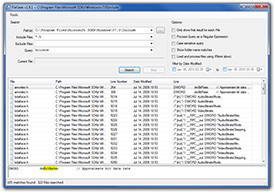 FileSeek can determine the file encoding and should work correctly across any of the encodings.